This raw zucchini noodle side dish is low in calories, a breeze to prepare, and fabulous fare on a hot summer night. The zucchini strips really do look and taste a lot like fresh pasta. Recipe contributed by Laura Theodore, from Jazzy Vegetarian, Lively Vegan Cuisine That’s Easy and Delicious (Book Publishing Company), reprinted by permission. Photo by Warren Jefferson. Put the zucchini in a large bowl. Add the tomatoes, basil, oil, and garlic and toss gently until thoroughly combined. Season with salt and pepper to taste. Serve immediately. I think your zucchini noodle dish is fab. I think your TV Program is fab. You are doing a great job of marketing Vegan. I do it everyday in everyway I can. Thank you so much for doing what you do for The Animal Children and our Planet. Oh thank you so much for the kind words Eric! 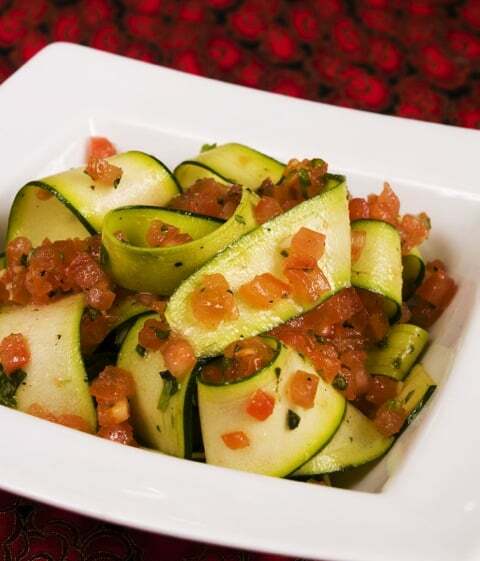 Your Zucchini Fettuccine with Fresh Tomato Salsa recipe is soooo delicious! A gal made some at our potluck. I got the recipe and made it the very next day. This is a wonderful side dish. People will be surprised that it is all raw. This is one of my favorite recipes. Thank you for sharing. Thank you, Alma! So glad you enjoyed this.